Finest quality perfect rise. For bread makers and hand baking. Fast and easy gives bread a lift. 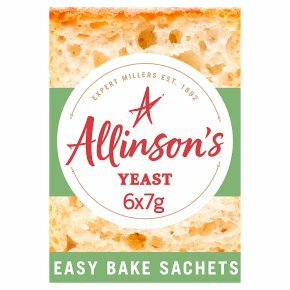 Suitable for vegetarians.Our Easy Bake yeast is quick and reliable and ideal for bread making. You can use easy bake yeast whenever a recipe calls for 'quick', 'fast action', 'instant' or 'easy blend' yeast. Baking by hand: Simply stir the yeast directly into the dry ingredients before adding any liquid, then knead and prove (rise) your dough. Using a bread Maker: We recommend that you refer to your manufacturer's recipes guidelines.